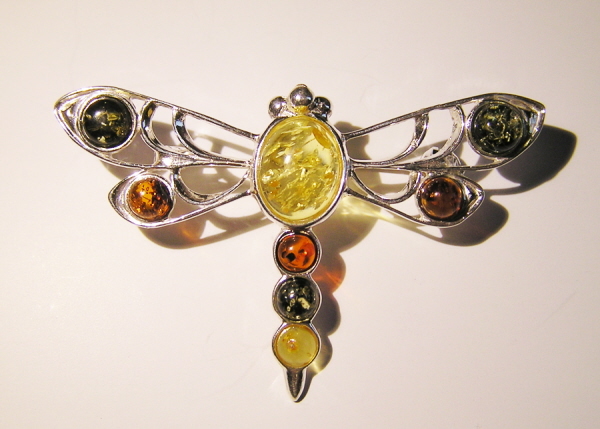 A Stunning little Solid sterling silver dragonfly brooch set with polished genuine Baltic amber. Baltic amber is World renowned for it's quality and clarity. While the amber doesn't contain any insects this is what amber is world renowned for. If you have seen 'Jurassic Park' you will know the mysteries and magic of this amazing substance - laid down millions of years ago when tree sap leaked from prehistoric forests. All manner of insects, moths - and even occasionally small lizards! have been found stuck inside the amber.